Most of the companies these days are outsourcing the assets from outside to increase their quality as well as the quantity of work they provide. But, to what extent they have to outsource these from outside, depends on various factors. Generally there are 3 approaches in this direction they are – In-house staffing, a hybrid of in-house and outsourcing and complete outsourcing. In In-house, company conducts its work or operation from within, without depending on people from outside. The company that conducts the operation does it by using its own employees and its own time without any outsourcing. When an employee works for the employer under a contract then he is called a contract staff. However, the contract employee works for a specific task with the employer and on a specific rate agreed upon by the two. The employee working on the contractual basis does not become the permanent employee. So, there is a difference between the independent contractor and the employee. 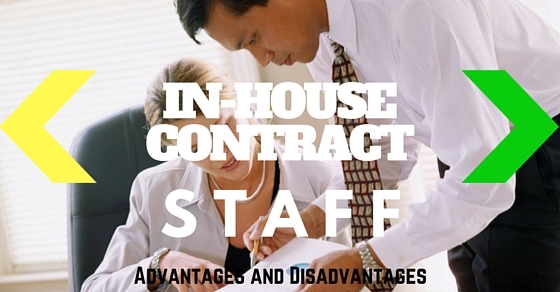 Both the In-House and contact staff have their own advantages and disadvantages. Here, are certain points that highlight the pros and cons of both. When the company has to train its employees for a particular job, then it is always beneficial to bring the trainer to the employees rather than arranging the training session somewhere else. By doing this, the company can save a lot of their expenditure and their purpose will also be solved. When a company has to train its employee for a specific job, then by arranging the trainer can be highly beneficial as the accommodation and the travelling charges can easily be eradicated. Also, these charges may vary from place to place and in big cities they may add highly to the expenditure. In house training of the employees avoids disturbance in the working process as the employees can train and adjust their work accordingly. If the employee has to go out for the training, then he will be able to continue the work on after he completes his work. The employer here can have more focused training as he can lay emphasis on the areas where he requires more efficiency. The institutions outside will cover all the areas as per their format. They will continue as per their prescribed format rather than laying emphasis on the areas of your importance. The In-house training can be scheduled according to the examples of the real life and thus will be more effective. The delegates will be able to lay emphasis on the areas required. To prepare the schedule for the training in accordance with schedule which are already existing can be a tiresome job for the employer. In-house training can make the working schedule be arranged in accordance. In case there are some emergencies in the office premises then that can be easily reached out by the employee, as he is taking training in-house. By doing this, work process will not be disturbed and the flow of work will continue. When employees from the different areas train together, then they can exchange information and new ideas which can help them to strengthen their team spirit and this way their team efforts will be more which will be beneficial for the company as a whole. Employees from different fields when exchange ideas and information then new ideas will be born and they will prove beneficial for the company as the best from each department will be available for its use. Since the employees are working within the company they will show more responsibility as the result can be fruitful for them in the long run. Although the company will save money by training the staff within, but at the same time the company will have to organize for the training room, projectors various other requirements that are demanded by the trainer. To fulfill all these requirements extra administration cost has to be incurred. As the employee is being trained within the premises so he can be called any time whenever there is an emergency in the company. In such a situation, it becomes difficult for the employee to attend the entire session and he might sometimes miss on some of the important features that are being explained in the training session. For some employees training sessions that are being organized within the same office premises might not appear to be serious. Thus, they may lack dedication and may try to miss the session the next day or whenever scheduled. Since the employees are working in the same office environment, with the same people and also with the same equipment, then the entire training session will become stale. There will be a lack of innovation which can be fruitful for the company. Employees who are trained within the company will miss out on the important chance of meeting employees from the other companies. They will not get exposed to the new ideas and new technologies that are being introduced. So, their knowledge will remain limited. As both the training session and the work are conducted within the same premises and by the same employees so, sometimes it might become difficult to manage the work in accordance to priority of the company. Employees have to work for extra hours or have to coordinate two things at the same time. This might become stressful for some employees and they might not take an interest in the training that is being given. Employees might not want to get trained because after training they might be shifted to some new department, which might not be liked by them. Employees who are hired on contractual basis for a fixed period of time and to perform a fixed job can get themselves a permanent job by impressing the boss by doing a good job and showing how beneficial you can be for the company. Since the employee is working as a contract employee and not as a permanent employee, he can deduct certain work related expenses which he cannot do otherwise. Employees who are working on contractual basis can work with different employers at one time. By doing this they will not only get more experience, but will also be able to earn a good amount for themselves. When an employer hires contract employees then he just wants to get the desired output from them. So, no matter how many work hours the employees put in, the most important thing is the result obtained by him. Employees working on contractual basis work simultaneously on different projects, so he can use the knowledge of one project in the other project and can get the desired results efficiently. Employees working on contractual basis can get a higher gross salary as compared to the other employees by working on various other contracts simultaneously. Since the employees working are not permanent so various taxes and other benefits that relate to pensions and so on are not deducted from the amount that is paid to these employees. Thus, the amount that they get is higher as compared to the other employees. Since these employees are not permanent they generally don’t take much interest in the office politics, which is an advantage for the employer. The employer can thus manage a good working condition for all the employees in the office. Contractual employment provides the opportunity to choose from the various offers that are available to the employee. So, he can easily decide the people with whom he would like to work. The employee can easily decide the duration of the break between the two contracts which is not possible in the permanent job. By doing this, he can plan for other activities as well. As the employee himself chooses his work area and also the people with whom he will work, thus he gets greater personal and job satisfaction from the work he does. Since the employer knows that the contract employee is working only for a limited period of time, so he might not invite him into the inner circle of the office and share important information with him. Employees who are working on contractual basis are not given ordinary benefits like vacation pay, benefits, pension and various other benefits that are provided by the employer to the other employees in the company. Employees will not be offered any extra pay by the employer in case the employer is getting any extra benefit due to fluctuations in the business environment. Employees work on a contract work with different firms at a time. By doing this they have to fulfill various commitments at a time, this may become too much work for the employee to handle. Employees once finish their work will have to find work for themselves as they are working on a contractual basis. This may use a lot of time and some of his resources might get wasted which might have used in some other projects. Contractual job is just a temporary solution to the problem of unemployment. Once the job is completed, the employee will again have to go looking out for a new job. Employees don’t have a job security and too much fluctuation in the job will build in more confusion. Contractual job is preferable only in the initial stage of the career. But later with family planning and various other commitments, employees give preference for the permanent jobs. When an employee signs a contract will have to do market research each time to understand the prevailing market trend related to that contract. This process can be time consuming and can even lead to extra expenditure. If a single contract of the employees fails to meet the deadlines or there are some other lags in the contract, then this can give a bad impression on the name. This can also affect the employees work practice in the long run. Since there is no fixed working place the employee will have to travel to various places which can be a tiresome job. The amount that the employee gets might be less if compared to hourly wage rate. An employer whether chooses the in-house staff or recruit people from outside, the key to success is still the dedication the employees shoe towards the work. Similarly, whether the employee chooses to work on contract basis or gets trained as in house staff, he shall always choose the areas which interest him.